Preventing Camping in World of Warships? In a recent YouTube video “the Mighty Jingles” described iun an aside how he and several others created an encounter map for World of Warships designed to prevent a common mode of play that really frustrates most of the Youtubers and community contributors to the game. World of Warships is a team game using arcade rather than realistic methods. The warships look great, the effects of combat look great, you can see the torpedo trails (yours anyway) in the water, and you can even see the shells traveling to the targets. But in the end it’s a remarkably unrealistic experience. There is no organization except to divide 24 players into two teams. There are lots of islands around and yet the maps are fairly small, so everybody mixes it up trying to destroy enemy ships and capture certain locations to score points. I say everybody, but it’s common that battleships will “camp” at the back of the map, shooting at very long ranges. This can be effective because visibility is almost always perfect, even at ranges where in the real world much of the ship would be under the horizon. As long as a ship on your side has spotted the opposing ship then you can also see it perfectly. But if no one has got within its detection range, it could be less than 10 km from your ship and be invisible despite the clear weather. The clarity makes it quite easy to aim as well. Battleships are more effective in winning the game when they wade in and take damage for their side (they have many heals to recover damage) and more effectively blast the enemy. But the majority of battleship captains won’t do that. So Jingles and company designed the map with four point-producing capture points (which are large circles), one in each corner. (Ordinarily these are between where the two sides spawn.) This is a simple but clever way to be sure that there’s nowhere to camp. At some point I decided to try to think of other ways to achieve this. First, if you want ships to melee, put them into a melee situation almost immediately, don’t give them the opportunity to camp. As the game stands now the 12 ships on each side spawn on one side of the map out of sight of the other side. The capture points generally are in the middle. I’d start each side in three groups of four ships in a sort of circle or hexagon alternating one side and the other. So if you imagine a clock face, one side would spawn at 1 o’clock, 5 o’clock, and 9 o’clock. The other side would be at 3, 7, and 11. This would put ships fairly close to enemies without much opportunity to fade back into the background. In effect it means there’s no “our side of the map”. Second, and simple to implement, is to recognize that it’s much too easy to aim and hit targets in the game, especially a long ranges. There is a dispersion factor in firing, but nothing to model that visibility is usually much worse as you get farther away, even on a good day. So I would add an increasing factor that represented gun-sighting difficulties, so that someone shooting from very far away is much less likely to hit (quite apart from the actual quality of their aim) than if they were much nearer the enemy. At some point that means the ships very far back aren’t going to hit much of anything. They can still be “safe” but they can’t get enough damage to say so - yet experience points (to get more ships) derive considerably from damage inflicted. That will cause some of them to move closer, though I imagine others won’t change their behavior. My game Hastings 1066, about the famous battle where William of Normandy conquered England, is a board game in disguise. It functions as a board game, yet uses cards, with the result that it costs buyers a lot less than if a physical board were included. Yet I’m told by a publisher that wargamers don’t generally care for card games. I think I understand why, but the objections do not apply to Hastings 1066. If you’re not depicting maneuver (and the geospatial relationships that make maneuver meaningful/possible) then you can’t depict battles – and it’s hard to depict wars. We can’t model wars in games, we model generalship, but without maneuver there is no generalship. Wargamers may also feel that card games are “taking over,” and they don’t like it. 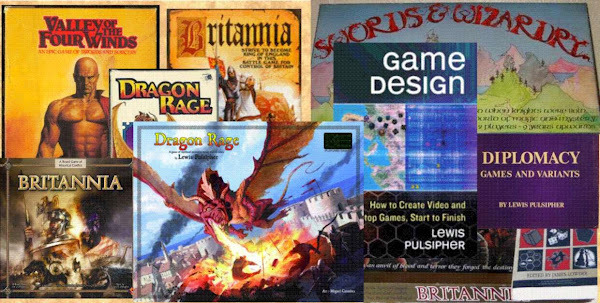 I recall walking around the dozen tables in use at a big meeting of the NC State Tabletop Gamers, noticing that every game being played (none of them a CCG) was primarily a card game, and the only board game was the one being playtested at my table. Not surprising that wargamers would rather not have deal with card games. The fallacy of this perception is that you can use cards without a physical board to depict maneuver and geospatial relationships, as in my game. In practice, Hastings 1066 is a board game, not a card game, that happens to use cards for units rather than using blocks or tiny counters. A board game isn’t a game that uses a board; many games that use a board are only tracking various statuses that could be tracked as easily in other ways. For example, some of the recent Munchkin (deluxe) versions have a board, but all it does (in Zombie Munchkins at least) is to track the experience level of each player. This has been done in other (non-board) ways for many years. Is Zombie Munchkin a board game? Not only no, but “Hell No.” The appearance is of a board, but the function is not. Hastings 1066 uses cards for double duty, as units and as the board (in conjunction with two strips of cardboard). The layout looks like a grid. I could have used a board with that same grid, but that would have raised the price of the game drastically. A board is the most expensive part of a board game, and if it’s a mounted board, it requires use of a much larger box. Mounted boards are printed in 11 by 11 inch segments; that requires an 11.5 by 11.5 inch box. The larger box costs significantly more than a smaller box. Moreover, Hastings is not only a deck of cards. There are the map strips, the cubes for marking arrow wounds, and the markers for William and Harold. Those components would be the same if it were a “board” game. A comparison of Hastings with CCGs shows great differences. CCGs are usually “special powers card games”, as I call them for lack of a better name. Each card has a different exception to the standard rules. They tend to be tactical games, and rely on combos for much of the interest. My game uses no combos or exceptions, though it is tactical as any game about a singe battle is likely to be. It is much more like a board game than a CCG. In appearance, CCG cards have tiny text and numbers. Everything you need to see in Hastings is in large print on an uncluttered card. I’ve designed a number of card games, but none of them in the CCG category, nor in the special-powers-combo style. Yet wargamers may tend to assume that a card game is CCG/combo style. As an example of the latter, recently a game called “Tears to Many Mothers” (really?) that is ostensibly about the Battle of Hastings was Kickstarted. But if I can judge from its Kickstarter, it’s a special-powers game with virtually no maneuver or geospatial relationships. That is, it cannot be a wargame despite the supposed topic. But with gorgeous artwork, and an audience on Kickstarter that tends to like gorgeous art (and special powers combo games), it Kickstarted very well. Wargamers, however, might point to it as “what’s wrong with card games”. Pay attention to the components of a game that count. It’s function, not appearance, that determines whether it’s a good game to play. Another topic that comes to mind is microgames. These were popular board games of the 1970s and eighties. The most popular was Steve Jackson’s Ogre in 1977, while my game Dragon Rage (1982) was another. These games had thin, tiny unit counters and cardboard boards, and originally came in a plastic bag (DRage was in a small box). You could carry them with you and play (most of) them in less than an hour. Yet they were fully functioning board games, usually for just two players. Microgames disappeared a long time ago - people no longer accept thin, tiny cardboard units. They have largely been replaced in the market by card games, CCGs and otherwise. DRage cost $10 in 1982, which is equivalent after inflation to $25.42 in January 2018. A $5.95 game from 1970 would be $37.82 today (big inflation in the mid-70s). The pre-order price for Hastings is $24 (same as the Kickstarter price), MSRP is $35. Hastings 1066 is an example of a “new” microgame, something you can carry with you and play quickly when you have a little time. Dragon Rage was reissued in 2011 with large, thick cardboard pieces, a mounted board, and an additional map and scenarios on the other side of the board. It cost more than three times the $24. Hastings 1066 could have been made much more expensively, but it would no longer fit that niche of a board game microgame. Should Games Cope with Resignations and other forms of Quitting? This is a very good question sent to me by someone I didn’t know. He’d designed a “Civ Lite” game for 5 or 6, where he’d written rules for resignations. But he was told that was “outdated” by an experienced designer. I don’t believe in “outdated” rules or concepts in game design, that’s pointless snobbishness rather than clear thinking. What’s good is good whether it’s old or new, and it always depends on the situation. If it’s bad, it doesn’t matter if it’s new or not. If a game can be designed so that a player can leave the game, whether it’s an official resignation or for “life reasons” (emergencies, rides, etc. ), that should make it a more flexible, and consequently better, game. Similarly, if a game can be designed to allow people to join in after it starts then that should make it a better game. I have some simple games using cards that allow the latter, in fact someone recently came into one soon after the start and won. But I don’t think I have any game with rules for what happens when someone quits. I do have games (other than Britannia) with submission rules so that a player who would otherwise be wiped out can continue to participate in the game, and perhaps if things fall his or her way, can do fairly well in the end. I’ve seen it happen. Go back far enough, and resignation was an option in a two player game only, but most games were two player games. If a player thought he or she wasn’t going to succeed it made sense to resign, end the game, and play something else rather than continue futilely. But in a game for more than two, players are usually expected to do the best they can for the entire game. In that sense of expectation, a resignation rule is irrelevant for a game with more than two players. I confess I see it my duty as a gamer to fight to the bitter end rather than give up, and from that point of view you could say a resignation rule should not be written into a game because it encourages players to give up. But that doesn’t cover the life reasons, which I think are more common than a simple desire to quit. “trapped in a bad situation” and want to quit are simply weak players and don’t realize how many options are available to them that might bring them back into contention. Another way to say this would be that many players are lazy, but that’s the nature of contemporary hobby game players. For me, a serious game is not “an engine designed to convert effort into fun” (my correspondent paraphrasing someone else). This is an attitude common to the Age of Comfort, when no one ever wants to be “uncomfortable”. There is more to it than that. You might be able to say that about a casual game, and very likely about a party game. But in serious games there’s more than mere fun involved. And expectations are different. “Resignation” rules are relatively easy in incorporate into a game with low player-to-player interaction such as most Eurostyle games, where people are really solving their own puzzles with little or no reference to other players. It’s likely to be much more difficult when the game is a high player-to-player interaction game where what players do depends heavily on what other players do, as in wargames especially. Unfortunately, quitting when things aren’t going well is a feature of modern life. I’d say my correspondent did well to include rules to cope with someone leaving the game, but I ask everyone to encourage the players to stick with the game all the way to the end rather than quit. Don’t encourage quitters, as players aren’t likely to become better players if they quit when things don’t go their way. • Where did we start out with in games? • "Why should designers avoid these two extremely popular mechanisms? • Catch-up Mechanisms - Why? Where did we start out with in games? I suspect games started with players using their physical bodies, for example, in wrestling or running. Wrestling is the ultimate direct conflict between two sides. Running is the ultimate parallel competition, if you're running in separate lanes, because you can't do anything to hinder or help the opposition. The first games, then, were likely "athleticware", depending primarily on athletic prowess and skill. Games of chance probably preceded board games. Even where dice are unknown you can have a game of chance, as long as you can find objects that are two-sided that can be flipped or thrown. For example, you can throw a bunch of sea shells or throw a bunch of stones, you can even split a stick lengthwise and then throw a group of sticks to see whether they come up flat side or round side. We know from some games that use these methods that the ancients were poor at probability in relation to these two-sided questions. At some point someone invented a boardgame, if only to put holes in the ground for some form of mancala. Card games (and tile games beginning with dominoes) came vastly later. So the ancient Greek Olympics involved everything ranging from direct competition to entirely parallel competition, but it was all using one's body. In that respect. These are athleticware, as opposed to thoughtware/brainware which occurs when you play a board game where good thinking is your path to success. With video games, we’ve veered back toward athleticware (especially in AAA, not so much in casual). Comment on a forum "Why should designers avoid these two extremely popular mechanisms? (Worker placement and deck-building)"
Why would I use a mechanism simply because it's popular? Especially a mechanism I dislike personally? I adapt mechanisms to the situation the game represents, or I devise my own mechanisms. That is, I might design several games using the same base system that I've devised, but I don't go out of my way to use a mechanism devised by someone else (though I have nothing against that, I just don't intend to do it). Long ago I did adopt other systems (Stratego, though quite modified). Not these days. Now, there are SO many worker placement games, and SO many deck-building games, why would I want to make yet another one? Many years ago (when it was still new) I did consider adapting deck-building to a Zombie apocalypse-style game, but it didn't work for me. Comment on a forum: "But a board game should not be too punishing either. I despise board games where you just can't catch up when someone has an early lead, and where you already know far before the end that you will lose." "Should" is a slippery word, different people have different opinions. Nor does every game need to be the same. So "punishing" mistakes is more appropriate in some games, less in others. It's more often puzzles/parallel competitions where you can't catch up, than opposed games. Because in the former you have no strong way to affect the other players. Nonetheless, there will be times when one player will play much better than others (or be much luckier): should that player be punished by having to put up with (from their point of view) bogus catch-up mechanisms?